Summary: The world hasn't ended...yet. My Thoughts: It took me a few minutes to get into this one. Partly because I couldn’t really remember all the characters. There were a bunch and I’ve read like a million books since than. Not really a million but quite a few! We are back with Dean and his brother and the other kids in Monument 14. Some of the kids are still in the store while some are on their way to Denver to get help. Man, this one was just as crazy as the first. We know how dangerous it is to go outside, the air is horrible and depending on their blood types crazy things can and do happen. This one goes back and forth between the kids on the bus and the kids still in the store. We learn so much more about each character and we see them interact together. Things aren’t pretty. I still love all the characters and I think the plot is still interesting. We see how much more they struggle in this one, and that ending. Man, another ending that makes me want to read the next book. This one was also really short. They are books I just fly right through. Now what? I get stuck waiting again for the next one!!! Overall: Really enjoyed it! The ending had a lot of moments that almost brought tears to my eyes. Happy moments, sad moments, crazy moments. 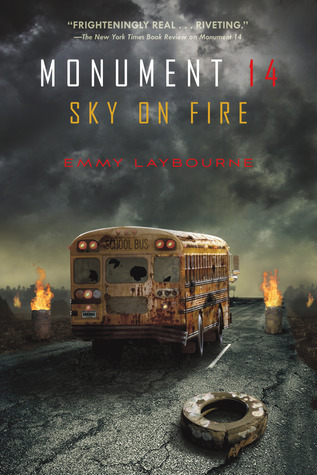 If you read Monument 14, don’t forget to pick this one up to continue! Cover: It’s alright. It’s so dark! I didn't love this one as much as the first one, but it was still good! For some reason it took me quite a while to get into it, and I can't really pin point why. BUT... I still really enjoyed it!